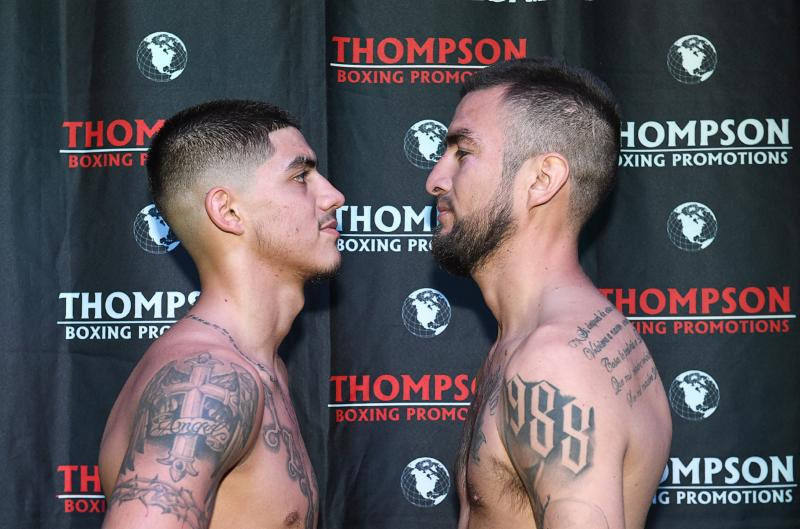 Top prospect Michael Dutchover (11-0, 8 KOs) weighed in successfully at Thursdays weigh in, measuring 134 lbs., while veteran Ruben Tamayo (25-11-4, 18 KOs) came in at the identical weight. Dutchover vs. Tamayo comprises the 8-round “Locked n’ Loaded” main event of Thompson Boxing’s season finale this Friday, Nov. 16, from the Doubletree Hotel in Ontario, Calif.
Dutchover, who turned 21 today, will look for his fifth win on the year. Limited tickets for “Locked n’ Loaded” are priced at $40, $60, & $100, and are available for purchase on the day of the event (Friday) from the will call booth starting at 5:30 p.m. local time from the Doubletree Ontario.